Friday: Mostly sunny and pleasant. Highs around 70 at coasts, 70s inland. Overnight Friday Night: Clouding up. Lows in the 50s. Saturday: Cool with developing showers. Highs in the 60s. Sunday: Milder and more humid, scattered afternoon showers and thunder. Highs in the 70s. Most of us start off sunny and cool Friday morning. 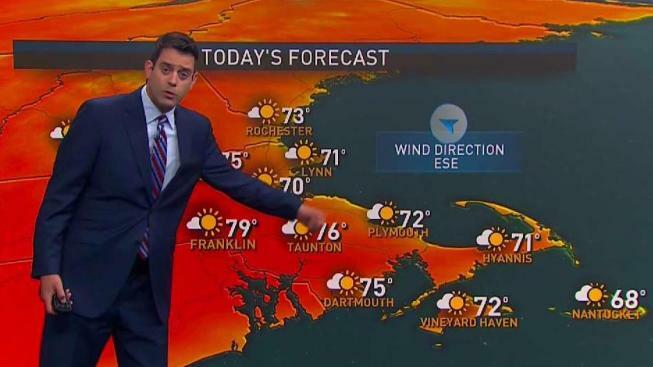 The exception is along the south coast from Connecticut to Cape Cod, where a front has stalled and the air remains rather muggy with temperatures near 60. On the opposite side of the spectrum in far northern Vermont, New Hampshire, and Maine, we cooled to the 30s. Most of us start out around 50 to 55 degrees. High pressure crests over New England Friday with light wind, and plenty of sunshine, high temperature in the 70s to 80, cooler at the beach with an onshore breeze. High pressure moves east of New England tonight, with low clouds and fog moving in to start off our Saturday. Temperatures will hold in the 50s to lower 60s overnight into Saturday morning. A warm front moving to Long Island will push rain showers across most of New England during the day. High temperature mostly in the 60s. Fog and drizzle may form along the shore in southern New England. A wave of low pressure will be moving along the front, bringing warmer and more humid air tomorrow night and Sunday. That low pressure system also brings a chance for showers and a thunderstorm on Sunday, along with a few sunny breaks. It is a lot warmer the second half of the weekend, with a high temperature in the 80s for much of New England, cooler at the coast where fog may be slow to burn off. Another high-pressure system from Canada brings in cooler air Sunday night and Monday with slow clearing, highs Monday back in the 70s. A warming trend returns for the middle and second half of next week with temperatures pushing 90, and some showers and thunderstorms by mid and late week.